If you’re looking to make your office more efficient, a portable document scanner is a must have. 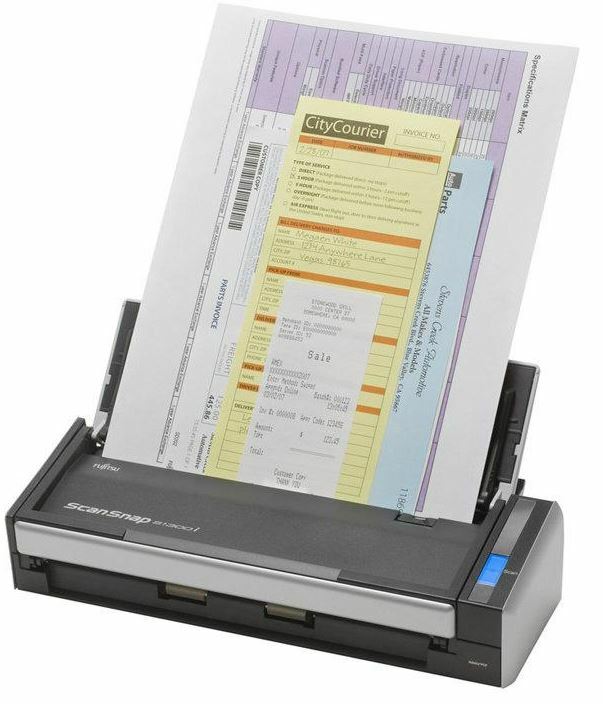 These handy little devices do the same job as your typical office scanner, but come in a compact and easy to use form. 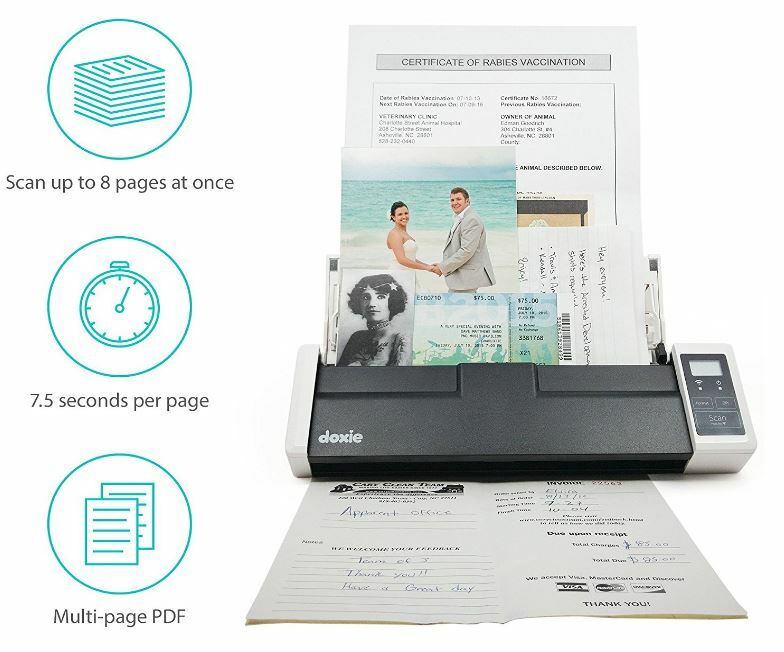 This allows you to digitize all of your documents in a matter of minutes, instead of having to haul everything back to a flatbed scanner or wait in line behind your coworkers. Once most users hop on the portable scanner bandwagon, they never look back. When you think about it, it’s much easier to type in a query and search through a folder containing hundreds of scanned documents than it is to dig through filing cabinets. At first, you might think that portable document scanners are nothing new. It’s true that some versions of this product have been on the market for several years, but there are many features that are offered only by modern models. Most of them support OCR (optical character recognition) allowing you to turn an image based document into an editable file. Most have built in batteries, so you can take them with you without having to worry about finding a power source. Others support wireless networking, so you can upload your documents directly to the cloud. Let’s take a look at the three best portable documents scanners on the market. After, we’ll help you pick the one that’s right for you. This Japanese company is a bit of a jack of all trades. But their most popular products are the ones that use their high quality digital imaging technologies. They’ve been making scanners of all types for many years, and are known for high quality and reliability. 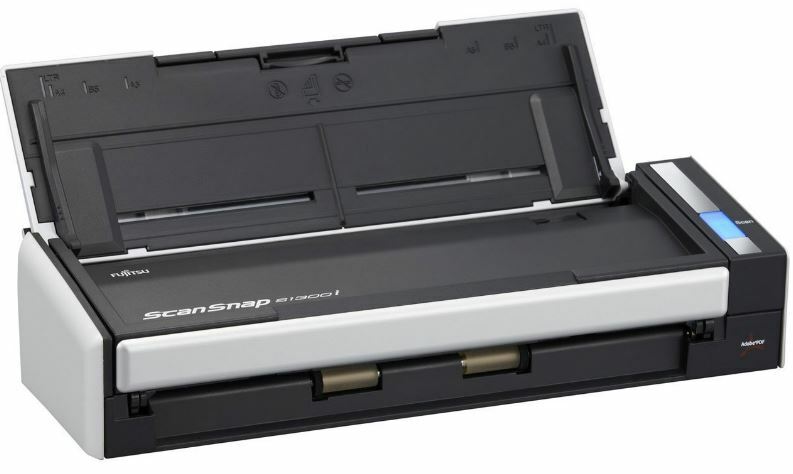 The ScanSnap S1300i is their current top tier portable document scanner, and one of the bestselling products in its category. The Fujitsu ScanSnap S1300i is strictly utilitarian in design. It’s black and silver design is both modern and functional. Underneath it’s sleek exterior is the same great technology found in Fujitsu’s much larger desktop counterpart. For you, this means that you’ve got desktop quality scanning in a package that you can hold in your hand. Just because you have all this advance technology doesn’t meant that you’re stuck trying to figure out a complicated system. It’s designed to be as easy to use as possible, capable of being operated with just a single touch of a button. The S1300i can scan both color and grayscale images. The top panel flips up to act as a feeder for the scanner. It’s got a total capacity of 10 pages of standard 8.5″ x 11″ documents. 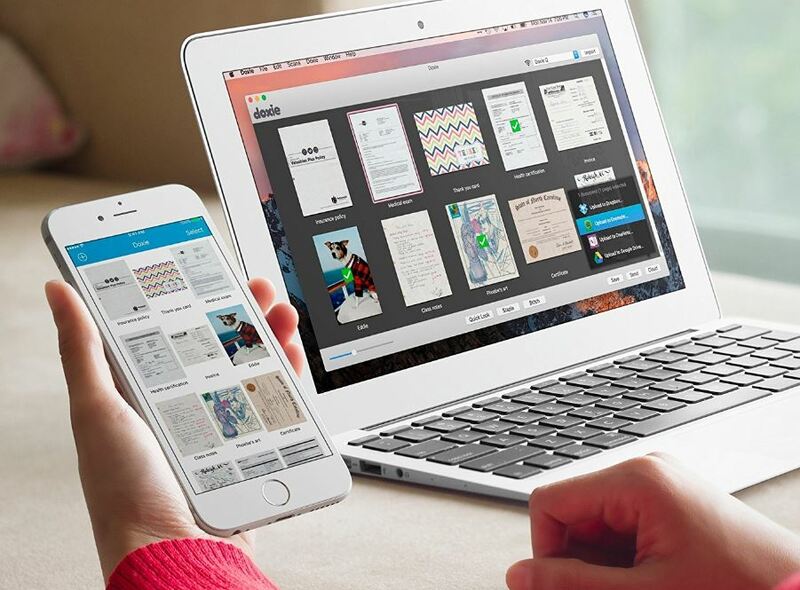 But you’re not limited to just one paper size, as it can automatically adjust to suit any paper size. This allows it to scan business cards, photos, and any oddly shaped document with ease. This is possible thanks to its single roller. Many scanners have multiple feeding rollers across it’s width. The disadvantage to this system is that if your document is feed into the wrong area or isn’t an expected size, it might jam up or feed unevenly. 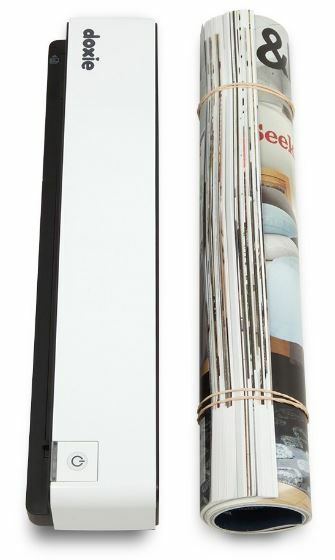 Since this model has a single roller running the entire length of the feeder, it can even flatten out documents like brochures that may not want to lay flat. Most scanners require you to manually enter the settings such as size, quality, and color. This one automatically detects what’s right for your document. It can detect whether an image is color or black and white, and automatically choose the correct DPI settings. But our favorite feature is the auto cropping. Generally, if you scan a business card without specifying the size, you’ll be left with one tiny image in the center of a massive image. Sure, it’s not that hard to crop on your own. But the auto-cropping feature means that you can scan a large volume of documents in different sizes without having to change settings. The Fujitsu ScanSnap S1300i saves images at 600 DPI by default. Some documents will be read at 300 DPI, but you’ll only encounter this when using the OCR function. This isn’t a setting that you need to change, it’s all done automatically. It’s supposed to detect how much detail is in an image, but we’ve noticed that it’s very sensitive. A single graphic on a page, or wrinkles in an old document will be detected as graphics. This causes the scan quality to bump up automatically. It’s worth noting that images aren’t particularly large, so there really is no disadvantage to this feature. You always get crystal clear photos with the touch of a button, and OCR is incredibly accurate. The ScanSnap S1300i hooks up to the USB port of your computer, and does require some drivers to be installed. It’s powered entirely by the USB bus, so there is no need for any additional power cable. Because it’s portable, Fujitsu knows that you won’t always be using your own PC. It’s set up to scan directly to the cloud, allowing you to upload your scans to Dropbox, Evernote, SugarSync, Google Docs, Salesforce, and Chatter. This is the most compatible scanner we’ve come across, so you’re certainly able to find a system that works for you. Doxie first made a mark on the portable scanner industry when they released one of the most well-rounded scanners on the market. At the time, the industry was in a bit of an awkward place. Desktop scanners were quickly advancing in technology, but the portable models were falling behind. Because there were so many benefits to the desktop models, portable sales fell. This created a catch-22 situation. Because portable scanners weren’t selling very well, manufacturers felt no need to upgrade their older systems. Doxie released one of the first “good” portable scanners, and proved to the world that there was a need for high end portable scanners. The Q is the high-end version of this original product, and has some key upgrades that we really enjoyed. When you first lay eyes on the Doxie Q, it doesn’t look like much. If anything, it just appears to be a printer that was chopped in half. But once you open up the face plate, you’ll know that it’s got a lot to offer. The LCD display and simple control system on the right let you choose the exact settings you want, and the flip-up hopper lets you load up to 8 documents at a time, regardless of size. This scanner certainly packs a punch. With 8 page capacity and 7.5 seconds per page, you can scan 100 pages in under 15 minutes including the time it takes to load the next batch. With the touch of a button, you can select “multi-page PDF” mode that makes scanning these large documents much easier. Most scanners will take a 20 page document and split it into 20 separate images. 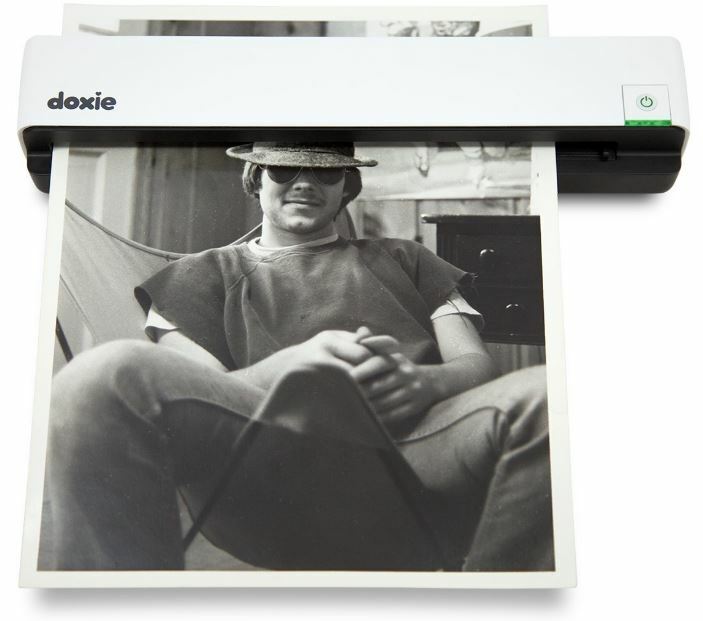 The Doxie Q allows you to hit a button, scan all your images, then press the button again when complete. It can then assemble everything into a single document, helping you keep your data organized. 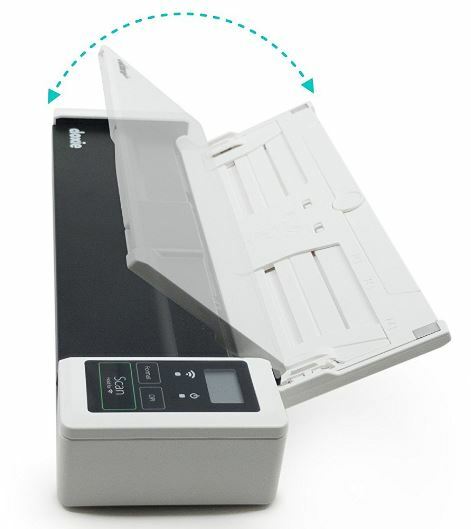 This scanner is most suitable for large documents (such as the ones printed on legal paper) since it’s expandable feeder extends out to stop your pages from flopping over. But the best part of the whole system? It’s completely battery powered thanks to an internal lithium ion cell. This means that you don’t have to plug it into anything at all to start scanning. At 600 DPI, the Doxie Q can put out the same great quality you’d expect in this price range. We noticed that the colors are a little more accurate on this model. This means that it’s suitable for photo scanning just as much as it is for documents. It can dynamically adjust contrast, making it better for black and white. If you’re using Doxie’s free software, you’ll notice that this helps make it’s OCR technology much more accurate. This will save your life when you’re sending a document to your boss without realizing that your C’s turned into O’s just because of a little dust. Since it’s designed to be battery operated, you aren’t expected to have a computer to hook it up to. The Doxie Q connects directly to your Wi-Fi network and can scan to a locally networked computer, or directly to the cloud. Dropbox, Evernote, OneNote, and iCloud are all supported, covering the majority of the popular providers. We’re a huge fan of Doxie products. Although the Q is their flagship model, the Go is it’s little brother. This portable document scanner is a little more affordable. If some of the features in the Q are overkill for your needs, the Go is a great alternative. The Doxie Go is the most compact scanner on our list. With just a single button needed to operate the device, you know that it’s going to be easy to use. Almost every part of the Go is automated. It automatically detects when you insert a page, and starts feeding it. It can detect the color, type of document, and size all without any user intervention. The only manual setting is the DPI. Notice that green light below the power button? This indicates that it’s in 600 DPI mode. Long press the button and the light will turn orange, showing that the scanner is now recording images at 300 DPI. Due to its compact nature, this scanner requires that documents are fed in one at a time. For many, this is a reasonable trade off considering it’s ultra-compact size. But when you have a scanner that you can take anywhere, you want to make sure that you can use it anywhere. This is the only scanner on our list that is completely independent of any other hardware. You don’t need to hook it up to an external power supply thanks to its built-in battery. You don’t have to connect it to a computer, or even a wireless network thanks to its built-in storage. You can save files locally and download them to a computer later. Although it still scans at 600 DPI, the image quality isn’t quite as good as the Doxie Q. In our tests, this scanner is perfect for use with documents. For images, it might not be the best option. It doesn’t include built in OCR, but it does have the same contrast adjustments as the Q. This means that you can use software OCR. Doxie includes a free OCR program with the scanner, so you’re not missing out. The basic model doesn’t include Wi-Fi, but if this is a feature you’re after there are two options. You can pick up an eye-fi card, slip it into the SD card slot, and connect to any wireless network in the area. There is enough internal storage to hold 300 scanned documents, but this is easy to expand if you need. You can add a USB memory key or an SD card, for up to 32 additional gigabytes. Which Portable Document Scanner is Right for Me? 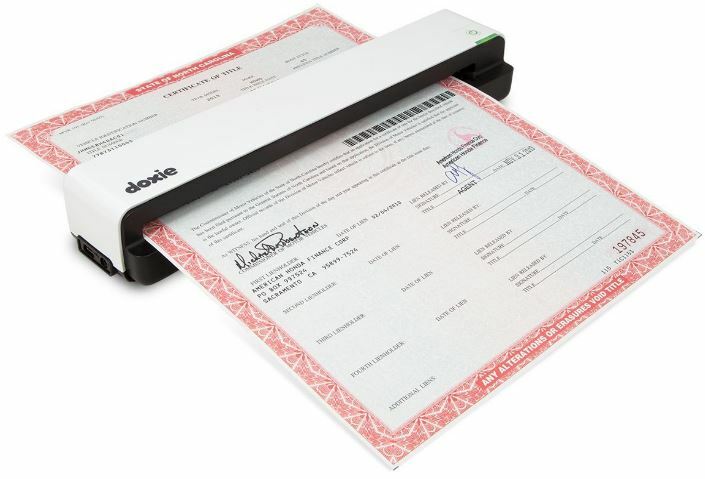 For the on-the-go business man who wants to digitize documents as you get them, the Doxie Go is an excellent choice. It’s the most portable of anything on our list, and operates completely independently of any other hardware. Alternatively, the Fujitsu ScanSnap S1300i is ideal for anyone who wants the best quality possible. It’s essentially a desktop scanner in a portable package, making no compromises in the way of quality. Our personal favorite, the Doxie Q, is a mix between the two. It’s very high quality, but also incredibly portable. With a battery and Wi-Fi, this scanner is suitable for use in the home, office, or on the road. I am in need of a portable scanner to scan directly to my iphone. I am always on the go, wifi is not available. Is there any scanner that scans directly to an iphone without wifi?